NBC’s Thanksgiving Day special, “The National Dog Show Presented by Purina®,” will crown one of America’s great purebreds as its 2017 champion on Thanksgiving Day, bringing canine competition and family entertainment to America’s viewers for the 16th year. The holiday special (noon-2 p.m. in all time zones) follows the Macy’s Thanksgiving Day Parade® on NBC and is watched annually by a total of more than 20 million viewers. Over 2,100 dogs encompassing 191 breeds vie for Best in Show honors in the tradition-rich Kennel Club of Philadelphia competition. An encore presentation airs on NBC in primetime on Saturday, November 25, from 8-10 p.m. ET. The TV special is a celebration of man’s best friend, hosted by beloved TV personality John O’Hurley and expert analyst David Frei, who have been together since the launch of the popular holiday special in 2002. Mary Carillo will report from the backstage benching area as the dogs prepare to compete and former Olympic figure skaters Johnny Weir and Tara Lipinski will also lend their distinctive presence as digital contributors. The show’s popularity over the past 15 years is a tribute to the dogs in our lives and its time slot following the Macy’s Parade from noon-2 p.m. in all time zones, before football viewing takes over the day. 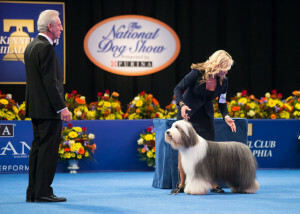 The National Dog Show boasts a powerful digital presence at NBCSports.com and on the NBC Sports App that includes a live stream of the entire NBC Thanksgiving Day show, featuring all seven group competition videos and Best in Show. Because of heavy interest from breed enthusiasts around the world, the NBC Sports digital platforms offer an exclusive look at the walks and judging of every breed-winning canine. The online video will include highlights from the TV special, behind-the-scenes photos and video, capturing all the backstage canine energy. It will be available on desktop, tablets and smart phones. The two-hour special’s unique content is facilitated by the “benched” format of the event, one of only three remaining shows in which the dogs are on display all day for the public.